With Black Ops 3 offering new ways to move around the environment, Free Run is essentially a mode where players can test their mettle when it comes to wall running, sliding, and just using Black Ops 3’s new movement system. To make it more exciting, there will be a leaderboards system where players can see the best times in any given course. You can watch the Free Run mode in the live-stream archive video above (it starts around the 16:00 mark). Aside from that, a new Call of Duty: Black Ops 3 “Loyalty Program” has been announced, too. 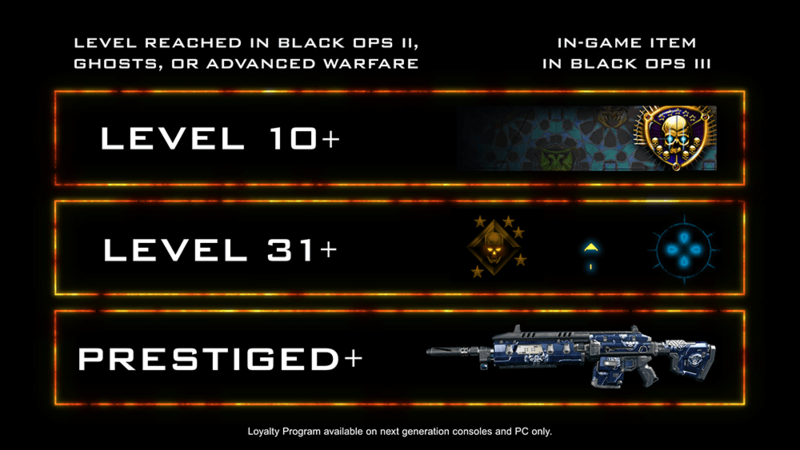 For people who reached certain levels in Black Ops 2, Ghosts or Advanced Warfare, you’ll get corresponding in-game rewards depending on the level you reached in one of those games. Note that the Loyalty Personalization Pack is only available to PC and now-gen (PS4 and Xbox One) players. Full details, as well as the FAQ can be read below. As a thank you to our loyal fans of Call of Duty, Treyarch has created the Loyalty Personalization Pack. Players that have reached the below levels and linked all their accounts by November 5, 2015, will receive these in-game items in Call of Duty: Black Ops 3*. Q: What do I need in order to receive in-game loyalty items? A: A Call of Duty® account that has been linked with your Sony, Microsoft, or Steam account, and the specified level achieved in Call of Duty®: Black Ops II, Call of Duty®: Ghosts, or Call of Duty®: Advanced Warfare by 11/5/2015 @ 9:00PM PDT. If you do not already have a Call of Duty account you can sign up here. After your Call of Duty account has been created, you will need to link your Sony, Microsoft, or Steam account to it. For more information on linking accounts please check here. You must link all of your console or Steam accounts to one Call of Duty account. Q: When do I need to achieve the specified levels in Call of Duty: Black Ops II, Call of Duty: Ghosts, or Call of Duty: Advanced Warfare to receive the loyalty in-game items? A: You need to reach the specified levels by 11/5/15 @ 9:00PM PDT. Q: When do I need to link my Sony, Microsoft, or Steam account to receive the loyalty in-game items? A: You need to link all your accounts by 11/5/15 @ 9:00PM PDT. Q: Do I need to link my Sony, Microsoft, or Steam account to a Call of Duty account to get my in-game items on Call of Duty: Black Ops III? A: Yes, you need to link all your accounts. Q: Where can I link my accounts? A: Visit https://profile.callofduty.com/loyalty/profile to link your accounts. Q: Which platforms can I redeem my loyalty in-game items on? A: Loyalty in-game items can be redeemed in Call of Duty®: Black Ops III on PlayStation 4, Xbox One, and PC. Q: Which platforms can I play Call of Duty: Black Ops II, Call of Duty: Ghosts, or Call of Duty: Advanced Warfare on to qualify for the loyalty in-game items? A: You can qualify for in-game rewards on PlayStation 4, PlayStation 3, Xbox One, Xbox 360, or PC. Q: What if I played Call of Duty: Black Ops II, Call of Duty: Ghosts, or Call of Duty: Advanced Warfare on one platform, but will play Call of Duty: Black Ops III on a different platform? A: The loyalty in-game items will be available to you as long as all Sony, Microsoft, or Steam accounts are linked to the same Call of Duty account. Q: What do I get if I reach Level 10 or higher in Call of Duty: Black Ops II, Call of Duty: Ghosts, or Call of Duty: Advanced Warfare? A: You will receive the Loyalty Calling Card in Call of Duty: Black Ops III. Q: What do I get if I reach Level 31 or higher in Call of Duty: Black Ops II, Call of Duty: Ghosts, or Call of Duty: Advanced Warfare? A: You will receive the Loyalty Calling Card and Loyalty set of reticles in Call of Duty: Black Ops III. Q: What do I get if I prestiged in Call of Duty: Black Ops II, Call of Duty: Ghosts, or Call of Duty: Advanced Warfare? A: You will receive the Loyalty Calling Card, Loyalty set of reticles, and Loyalty weapon camo in Call of Duty: Black Ops III. Q: What if I reached level 15 in Call of Duty: Black Ops II, level 25 in Call of Duty: Ghosts, and prestiged in Call of Duty: Advanced Warfare? A: We will choose the game where you have progressed the furthest and base your loyalty rewards off of that game. In this specific case, you would receive the calling card, set of reticles, and weapon camo because you have prestiged in Call of Duty: Advanced Warfare. Your Sony, Microsoft and Steam accounts must be linked to the same Call of Duty account to receive the in-game loyalty items in Call of Duty: Black Ops III. Do you qualify for any in-game rewards for Black Ops 3? Is this something you hope they continue using in future Call of Duty titles? Call of Duty: Black Ops 3 will be available on November 6 for the PS4, Xbox One, PS3, Xbox 360 and PC.